▪ is mindful, meditative, sacred, spiritual or holistic art that grows and glows with the unconscious, preconscious, conscious and super-conscious dimensions of life on Earth and existence in the Universe. ▪ embraces and flows from life, consciousness and compassion as wholeness. It Awakens the soul to the spiritual; Balances experience and expression; Centers attention with intention; and Delights in transforming images, thoughts, emotions and sensations with the rhythms of the breath and of the universe. ▪ transports the soul traveler through the realms of contemporary psychology and neuroscience, religious philosophies and spiritual traditions, and interfaith and post-modern practices leading to health and happiness. ▪ unfolds and enfolds experiences and expressions of light and delight as Windows to Infinity, Bridges to Intimacy, Wings of Integrity, Mandalas in Harmony and Impermanent Paths through Laughter and Silence. ▪ offers harmonious affirmations and transformative practices as integrated paths to realize one's purpose in life in consonance with the Rhythms of the Breath and of the Universe. The sound of the titles describing Ariosto's "Soul Travel" penetrated my whole being with vibrations of consciousness of my own life, created to contribute to God's colorful world. If you are ready to perceive who you are not from beyond your wildest imaginations, Integral Art may just be that most apt vehicle. Dr. Coelho's book is a harmonious weave of intellectual inquiry, awakened creativity, and a resounding pulse of spirituality. In this age of ours … Coelho's mystical note should have the power of making his readers [viewers] look within. P. R. Dubhashi, Ph.D., D.Lit. The author Ariosto Coelho, Ph.D., LMFT, is an integral artist, a spiritual writer and a transformational healer whose noble work has touched countless lives. By sharing visual descriptions of his soul as it travels through the four landscapes of the body, mind, heart and spirit he empowers the reader to recognize and appreciate wholeness. "I have been fascinated with art all my life. I recall that as a child in Goa [Estado da India Portuguesa from 1510 to 1961] my parents, brothers and sisters encouraged me to draw and paint. I remember my Dad framing one of my pencil drawings of St. Joseph on paper, placing it among the household pantheon and using it as one of the icons for family prayer. Among the Salesians of Don Bosco I was encouraged to display my visual art on the humble notice boards at first and, later on, in impressive exhibitions in Chennai, Bangalore, Mumbai and Goa, India. My desire to study and contribute towards a planetary ecology of religions and to seek a practical integration of the spiritual traditions of the world led me, initially, to Pontificia Studiorum Unversitas Salesiana in Rome, Italy and, later, to the California Institute of Integral Studies in San Francisco, USA. As part of my research project I drew a prismacolor circle or mandala entitled Moima which means 'Glory' in Konkani, the language of the Konkan region of India. I meditated on this mandala or circle of recognition and wrote my doctoral dissertation entitled “Mandalas Unfolding and Enfolding: A Phenomenological Paper.” This was an existential blend of East-West mystical perspectives on Philosophy and Religion and was published as Mandalas, Personal Mythology and Mid-Life Spirituality: A Trans-Epistemological Inquiry into Mid-life Transformation Blending Integral Art, Roman Catholic Tradition and Pūrņa Yoga (1994). I was privileged to conduct Mandala Retreats in California, Illinois, New York and elsewhere and to share my perspectives on Light and Delight [Appendix 2] with other seekers and artists. Besides pencil drawings I also worked with other media: Watercolors, Sumi ink on rice paper and Mixed media. In 1997 I specialized in Clinical Art Therapy at Notre Dame de Namur University and continue to use these skills with my young clients as a member of the South Central Youth Team of San Mateo County Behavioral Health and Recovery Services [Mental Health] as well as with adults as a Licensed Family Therapist and Interfaith Spiritual Director. Since May 2003 I am a member of an Oil Painting Group that meets every Thursday at the Senior Center in San Bruno in California. If I were to choose a term to describe my art, I’d call it ‘Integral Art;’ it flows simply from an integral perspective on life as a whole. It draws freely from both the light and the darkness within and beyond. It dwells fully on the soul as it travels with the Rhythm of the Breath. It blends delightfully with the Rhythm of the Universe, where infinity, intimacy and integrity blend in-harmony with impermanence. Integral art awakens the soul to the spiritual; balances between experience and expression; centers attention with intention; and takes delight in arranging forms towards revelation of awareness, thought, memory, feeling, sensation and motion beyond form (Swan 1975). Robert Aziz (2007) offers a similar perspective in The Syndetic Paradigm. He proposes that all of life is bound together in a highly complex whole through an on-going process of self-organization. I’ve noticed this self-organizing totality evolve in and through my art, especially the mandala or circle drawings and paintings. Like the metaphors of the swinging door and soul travel, the mandala or circle is a universal symbol and has many representations and meanings. 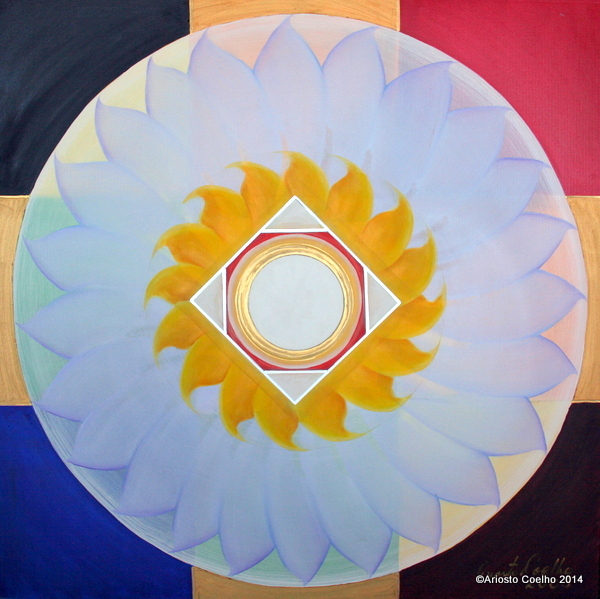 In Sanskrit a mandala is a circle [manda] or a center [la]. It represents the whole, the cosmos in miniature, a map of consciousness, a reflection of the soul, an instrument to unfold in a limited way the enfolded illimitable power or the lotus of enlightenment. P. R. Dubhashi (1993) asserts that to a Hindu mythologist the whole world is a mandala, and Robert Thurman (2001) adds that every human being is, more than a point of awareness, a mandala.